@cex_io Sending you my userID or making a support ticket won't help me because your card withdrawal option is UNAVAILABLE at the moment for all users. You can't even say when you will fix this issue since 14 January. @BTCismylife 2/2 Your user ID can help us to identify you in our system (please send it via PM). Then we would be able to trace your issue and try to find some personalised solution for you. @BTCismylife 1/2 Thank you for your reply. We need to emphasise that fiat withdrawal option is unstable, but not unavailable. Currently, it could take more than one attempt of transaction initialisation for withdrawal being processed successfully. @cex_io Thanks -- the issue has since been resolved, but there are some glaring customer service issues plaguing your system, unbecoming for an exchange as prominent as CEX. I would appreciate with a follow-up to my PM. @JonathanFitts Thank you for being patient and collaborative. Please check your PM. @cex_io_Admin_ @cex_io I've been emailing with support all morning. No progress. Email isn't working. What's going on? @JonathanFitts We definitely need to review your case more thoroughly. Please provide us with your userID or Support ticket number via PM as it was requested previously. Let as apologies for any possible inconveniences you might have faced. Guys, is @cex_io under attack or something? Been trying to withdraw funds, and the "system has been down" for an hour with no word from support or management. @JonathanFitts Kindly be informed that cex.io did not experience any attacks today. Also, in case of any maintenance, we update our Status Page: cexio.statuspage.io This page will allow you to be informed about the performance of our system. @cex_io_Admin_ @cex_io Your support just told me to trade my currency into different crypto (at a loss) for the privilege of withdrawing it from your exchange. Logging all of this. @JonathanFitts @cex_io_Admin_ Thank you for contacting us. We are sorry to hear that your latest experience with on our platform was somehow inconvenient. Please provide us with your user ID or Support ticket number via PM so we can help you out better. @fede1234567800 Thank you for your feedback. Unfortunately, from the latest period of time fiat withdrawals are unstable. Hence it can take more than one attempt of transaction initialisation for withdrawal being processed successfully. Please accept our deepest apologies for any inconveniences. @cex_io Fix your creditcard withdrawals you are an exchange and not a shoestore, people are waiting to withdraw their funds and can not already 1 month. Don't tell me that you have other methods of withdrawal, please, you can't fix the issue already one month. @BTCismylife Thank you for your feedback. Kindly note that card withdrawal option is now unstable. We would be happy to help you our if needed, please provide us with your userID or Support ticket number via PM. Your cooperation is highly appreciated. On Valentine’s Day, we want to help our customers express their love. 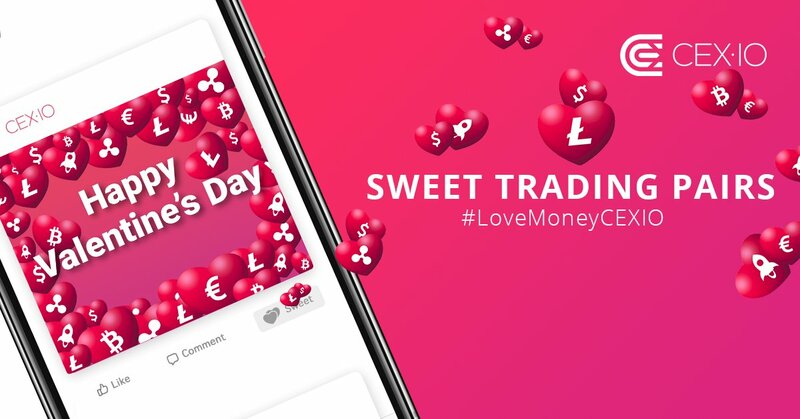 Place market and limit orders for our #sweettradingpairs – XLM/USD, XRP/USD, LTC/USD, BTC/EUR, XRP/EUR, and XLM/EUR – from February 13, 2019 through February 15, 2019 with 0.01% commission. Details on our blog. @Za_Bunny Thank you for updating us. It is really good to know that your transaction went through. Kindly note that it may take up to 3 working days to be processed and credited by the Banking System to your card. We do appreciate your patience and attitude. @Tom41367336 Thank you for contacting us. We are sorry to hear that your verification process takes so long. In order to help you, please be so kind to provide us with your ticket number via Direct Messages. We will try to speed up the process. @Za_Bunny Thank you for your comment. We are sorry that the withdrawals don't work for you. Currently, they should be functional. Could you please repeat your attempt or contact us via DM or support@cex.io so we could investigate your situation? Looking forward to hearing from you. @dmungay @pedroroco We are sorry to hear that. Please be so kind to check your inbox, we have sent you a private message. @dmungay @pedroroco We are sorry to hear that. Please be assured that withdrawals are not blocked, transactions are unstable, so withdrawal attempt may be rejected. Please be so kind to check your inbox, we have sent you a private message.